The project’s institutional arrangement is designed to plan, implement and monitor the project right from the community level to the Regional level and includes Ministry of DONER at the Govt. of India level. The project organization will have basically four levels namely, the Ministry of DONER, Regional level covering four project states, District level covering the individual project districts and Block level covering individual blocks. Additionally there will be a State level Project Support unit for convergence with the corresponding government development programmes. The project is under the overall governance of Ministry of DONER. 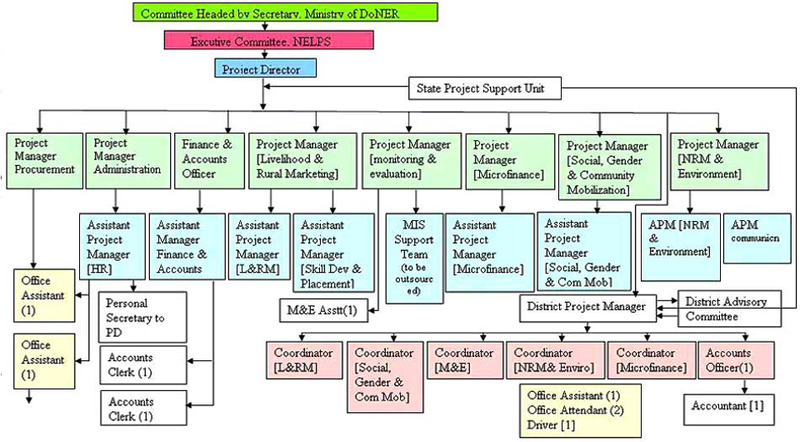 Ministry of DONER would constitute a Project Governance Committee (GC) consisting of Secretary DONER, representative from Planning Commission, Ministry of Finance, Rural Development, and Chief Secretaries of respective States. The Joint Secretary (JS) DONER would be the Member Secretary of this Committee. The Member Secretary would be assisted by a small secretariat consisting of a professional consultant hired on contractual basis. The Project Governance Committee would meet twice a year to review the project and take up policy issues affecting the project. It would also advise convergence of various government schemes at the level of community. The project would be implemented by the autonomous regional level Society registered and established by the Ministry of DONER, under the name North East Livelihood Promotion Society (NELPS). It is chaired by the Secretary, NEC and represented in the general body by all participating state governments as well as important institutions working in the region. The Executive Committee of NELPS consists of 7 members in which Secretary, NEC is the Chairman, the Joint Secretary, DONER is the Vice-Chairperson, the Project Director, NERLP is the Member Secretary and Nodal officers of the four project states are the members. From Tripura, Commissioner, Rural Development, from Nagaland Commissioner & Secretary Planning and Coordination, from Mizoram, Director, Rural Development and from Sikkim, Project Director, Sikkim Rural Development Agency are the members. The structure for implementation is visualized as a long term investment in promoting rural livelihoods in the region, beyond just the scope of the proposed NERLP project. The NELPS is headquartered in Guwahati. The World Bank supported NERLP would be implemented by a separate Regional Project Management Unit (RPMU) headed by a Project Director. The RPMU will implement the project through establishment of eight District Project Management Units (DPMUs) and district teams that will manage the field level implementation through the Project Facilitation Teams (PFTs) set up covering cluster of villages. The project implementation in each of the four states will be supported by a small State Project Support Unit (SPSU), housed within the respective state governments. RPMU would have the overall responsibility for management and implementation of the project. It will be headed by the Project Director. She/He will be the operational and managerial in charge of the project and head the organizational structure established at the district and lower levels for implementing the program. The Project Director will be supported by team of Managers, Assistant Managers and support staffs for different functions for managing and implementing the Project. There would be phasing of staff recruitment with assistant staff hired as the project grows and expands its operations. The MIS design, uploading, maintenance and updating will be outsourced. Besides, RPMU would hire the services of subject matter specialists, viz. in NRM, Agriculture, Dairy, etc. as and when found necessary to increase effectiveness of the project. In each Project states there will be one State Coordinator to assist the State Nodal Officer, NERLP in execution of the Project. The concerned State Nodal Department shall designate/appoint a State Coordinator purely on contractual/temporary basis. State Coordinator will ensure full involvement in project preparation and extend help to RPMU in design of Project. The major role of the State Coordinator would be in achieving convergence with various government schemes. The State Coordinator will ensure and maintain close liaison & effective communication between relevant departments of the State Government, Commercial banks, RRBs, Development Agencies & the Project Office. District Project Management Units (DPMU) would be set up in all the eight district headquarters of the selected districts in the four States. There will be a District Project Advisory Committee (DPAC) established jointly by the NELPS and the state government for oversight, monitoring and convergence with other programmes at the district level. DPAC would be chaired by the Deputy Commissioner and would have other district officers from line departments and banks, etc. Besides, DPMU would also hire technical experts in sectors for which expertise is not available locally, e.g. horticulture, agriculture, animal husbandry, etc. Project Facilitation Teams (PFT) would be working at the cutting edge at the interface of the project and the community. PFT is one of the most important units in the project implementation. All other institutional arrangements would help the PFT to work effectively and achieve the desired outcomes of the project. The PFT would be directly recruited by the project or alternatively the services of NGOs would be taken for them to set up the PFTs. The selection of NGO would be based on detailed criteria as spelt out in the Community Operations Manual. The PFTs will operate at the block level. The block will be sub-divided into six clusters of average of five villages. The PFTs will be headed by a Block Project Coordinator (BPC) who will be responsible for all the project villages of the block. Below the BPC there will be six Area Coordinators (ACs) (1 for each of the 6 clusters). PFTs would be forming the community organizations envisaged, viz. CDGs, SHGs, SHG village Federations and Producer Organizations. © Copyright NERLP. All Rights Reserved.